Zack Stamper and Samuel Meixueiro with the bike Stamper gifted to Meixueiro. 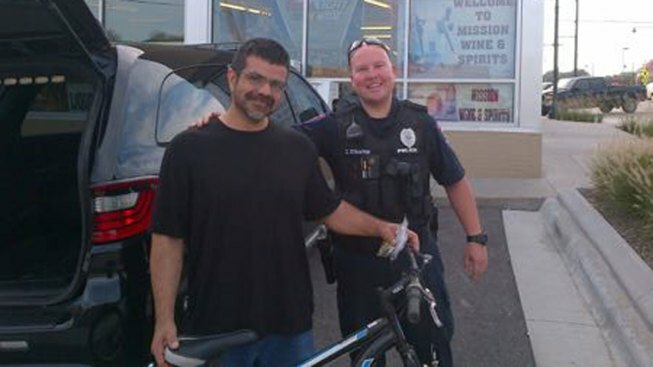 Roeland Park officer Zack Stamper says he was just doing his job last week when he gave Samuel Meixueiro a bicycle to ride to and from the man's work as a liquor store cashier. Stamper threw in a duffel bag to replace Meixuero's suitcase, which had a broken zipper. The kindness drew tears from Meixueiro, who says he's been staying in a church while trying to save money for an apartment. Stamper's gesture came after he was dispatched to investigate a report of a suspicious person in a park. That person turned out to be Meixueiro, who explained to Stamper his situation — and the foot-pounding treks to the job Meixueiro said he couldn't afford to lose. So Stamper drove the man to work that day. The officer retrieved a duffel bag from his basement and a bicycle from the department's assortment of surrendered or abandoned ones. Stamper spiffed up the bike and inflated its tires, ultimately surprising Meixueiro with the cycle and the duffel bag at his workplace.